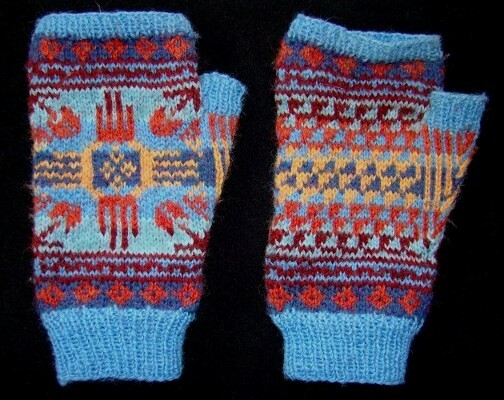 I made these gloves for my great mother-in-law for Christmas last year. They were a big hit. I was riding high from my success with my Snowflake Gloves and loving the two-color knitting. 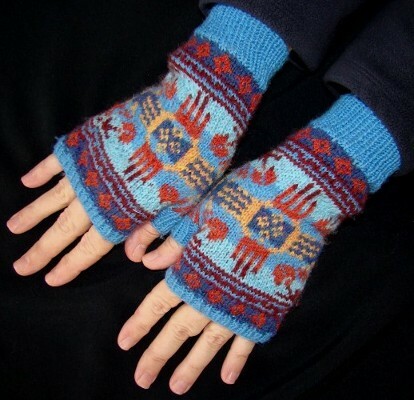 These gloves were an attempt to blend the Fair Isle style with traditional southwestern designs instead of snowflakes and diamonds. Although I did add in some “pine branches” in the corners to keep the Fair Isle relationship obvious. (To be honest, though, I think they could just as easily be arrows.) I spend a lot of time looking at Navajo and Pueblo pottery for the pattern bands and palm. DH helped me pick out the colors; originally, they were going to have some dark green and maybe some terra cotta brown. Even while I was knitting these, I wasn’t entirely happy with the colors. It wasn’t until the very end that I saw it come together. Edit 8/20/08: Fixed some minor errors. Fixes are in purple. 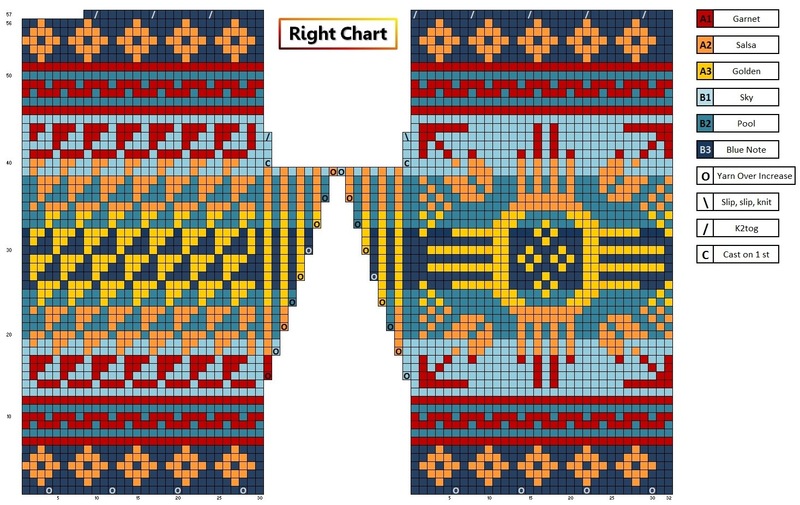 I’ve figured out how to publish chart better now, so I’m publishing the pattern on the blog, straight-up as it were. PDF is still floating around on my computer, if you’d like it, please email me. This pattern is written for 1 long circular needle (magic loop method) but is easily worked on DPNs or 2 circs. I suggest DPNs for the thumb, though. 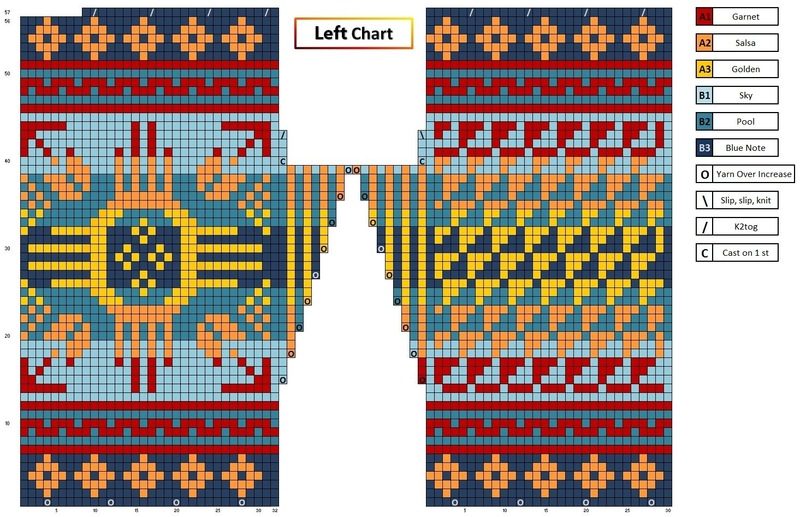 There are separate charts for the right and left glove for easier knitting. To make finishing less painful, weave in ends as you go by twisting/wrapping the last yarn for 10-15 sts on the new row. I join a new color 10- 15 sts early (the row before it appears on the chart) and carry it along, twisting/wrapping it every other st. This helps eliminate holes at the sides. The exact yardage of yarn is unknown, but the all colors need less than 1 ball, the A colors less than 1/2. You may notice that the geometric patterns don’t quite match up at the sides- the patterns were so perfect but wouldn’t fit perfectly, so I fudged. The break in the pattern is hardly noticeable on the finished glove. The gloves are meant to be snug, but not too tight, so be aware of the tension. These gloves can be knitted from the charts alone, but I have written out the instructions for rows with increases, decreases, or other things that need attention. If there are no written instructions for a row, follow the chart until the next written row. Charts jpgs are at the end of the written instructions. CO 54 sts loosely in B2 (Pool). Switch to B3 (Blue Note). Divide sts so that “Needle 1” has 32 sts and “Needle 2” has 30 sts. Work Left Chart until Round 13 is completed. Round 14: Knit in pattern to the end of “Needle 1.” Place first marker and make YO increase in color on chart. On “Needle 2,” make YO increase in color on chart, place second marker and continue knitting in pattern. Work chart until Round 55 is completed. Work 8 rounds K1 P1 Rib. Cast off loosely. For the right glove: Work Right Chart, with 32 sts on Needle 1 and 30 sts on Needle 2. All instructions are the same. Goodness–your patterns are a beautiful goodness! Thanks! Those are really gorgeous! Thank you for the pattern. When I get started with color work I’d like to try them. I love these mitts. Could you send me a copy of your .pdf version? Beautiful mitts. The colors really did come together.